The Battle of the Philippine Sea was an air-sea battle of the Pacific campaign of World War II fought between the US Navy and the Imperial Japanese Navy on 19 and June 20, 1944, off the Mariana Islands. The action was a disaster for the Japanese forces, who lost almost all of their carrier-borne aircraft and a third of the carriers involved in the battle. It was so one-sided that American pilots nicknamed it "The Great Marianas Turkey Shoot", and after the battle the aircraft carrier force of the IJN (Imperial Japanese Navy) was no longer militarily effective. In September 1943 IJN Headquarters decided that the time was right to go back on the offensive in the Pacific. Losses from the Battle of Midway had been largely replaced in terms of numbers of carriers, and since the US was attacking Japanese-held islands on their "island hopping campaign", the lack of planes themselves could be addressed with the addition of strong land-based forces. The result was Operation A-Go, which would take place some time in early 1944, attacking the US Pacific fleet while it launched its next major offensive. On 3 May orders for A-Go were sent out, and the waiting began. The Japanese fleet, commanded by Vice Admiral Jisaburo Ozawa, consisted of six fleet carriers (Taiho, Shokaku, Zuikaku, Junyo, Ryuho, and Hiyo), three light carriers (Chitose, Chiyoda, and Zuiho), five battleships (Yamato, Musashi, Kongo, Haruna, and Nagato) and supporting cruisers, destroyers, and oilers. 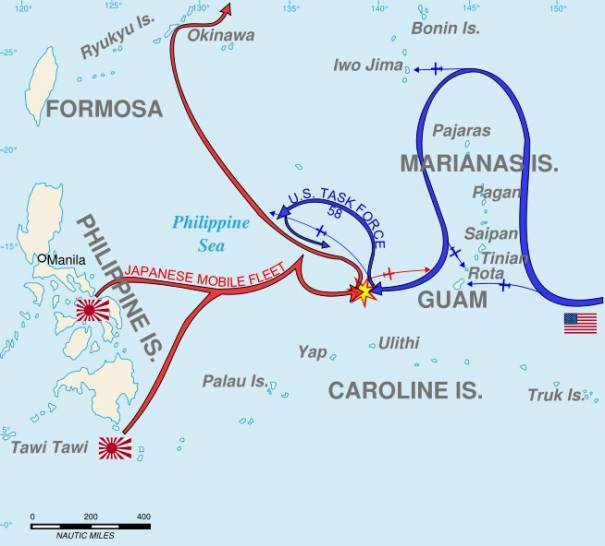 On 11 June US carrier-borne forces started a series of small strikes on the Marianas, convincing Admiral Toyoda Soemu, Commander-in-Chief of the Combined Fleet, that the US was preparing to invade. This came as something of a surprise, as they had expected the next US target to be further to the south, at either the Carolines or the Palaus, and therefore the Marianas were protected with a weak force of only 50 aircraft. On 15 June 1944 the US started their landings on Saipan, and Toyoda gave the order for the attack. The main portions of the fleet, consisting of six carriers and several battleships, rendezvoused on 16th in the western part of the Philippine Sea, and completed refuelling on 17th. The Japanese forces had been sighted on 15 June by American submarines, and by the next day Admiral Raymond A. Spruance, commander of the U.S. 5th Fleet, was convinced a major battle was about to start. By the afternoon of 18 June Admiral Marc A. Mitscher's Task Force 58 (the Fast Carrier Task Force) was formed up near Saipan to meet the Japanese attack. TF 58 consisted of five major groups. In front (to the west) was Admiral Willis A. Lee's Task Group 58.7 (TG 58.7), the Battle Line, consisting of seven fast battleships (Washington, North Carolina, Indiana, Iowa, New Jersey, South Dakota, and Alabama). Just north of them was the weakest of the carrier groups, Rear Admiral William K. Harrill's TG 58.4 of three carriers (Essex, Langley, and Cowpens). To the east came three groups of four carriers each in a line running north-south: Rear Admiral Joseph J. Clark's TG 58.1 (Hornet, Yorktown, Belleau Wood, and Bataan); Rear Admiral Alfred E. Montgomery's TG 58.2 (Bunker Hill, Wasp, Cabot, and Monterey); and Rear Admiral John W. Reeves's TG 58.3 (Enterprise, Lexington, San Jacinto, and Princeton). The big ships were supported by 8 heavy cruisers, 13 light cruisers, 58 destroyers, and 28 submarines. Shortly before midnight on the 18th Admiral Chester Nimitz sent Spruance a message from Pacific Fleet Headquarters indicating that the Japanese flagship was approximately 350 miles (560 km) to the west-south-west of Task Force 58. Shortly afterwards Mitscher asked for permission to head west during the night to an ideal launch position for an all-out attack on the enemy force at dawn. However, Spruance refused. Throughout the run-up to the battle he had been concerned that the Japanese would try to draw his main fleet away from the landing area using a diversionary force, and would then make an attack around the flank of the US carrier force—an "end run"—hitting the invasion shipping off Saipan. Instead he placed TF 58 on a purely defensive footing, leaving it to the Japanese to set the pace of the battle. Spruance was heavily criticised by many officers after the battle, and continues to be to this day, but it is instructive to compare Spruance's caution with Admiral William Halsey, Jr.'s impetuous pursuit of a diversionary force of Japanese carriers at the battle of Leyte Gulf. At 05:30 TF 58 turned north-east into the wind and started to launch their air patrols. At about the same time a number of the 50 aircraft on Guam started up on search missions. At 05:50 one of these, a Mitsubishi Zero, found TF 58. After radioing in its position, he attacked one of the destroyers on picket duty and was shot down. Over an hour the rest of the Guam forces were being formed up for an attack. They were spotted on radar and a group of Grumman Hellcats from Belleau Wood were sent to investigate. They arrived while the attack was still only launching from Orote Field. Minutes later additional radar contacts were seen, which were later discovered to be the additional forces being sent north from the other islands. A huge battle broke out, 35 of the Japanese planes were shot down and the battle was still going an hour later when the Hellcats were recalled to the carriers. The recall had been ordered after a number of ships in TF 58 saw a number of radar contacts 150 miles (240 km) to the west at about 10:00. This was the first of the raids from the Japanese carrier forces, with 68 aircraft. TF 58 started launching every fighter they could, and by the time they were up the Japanese had closed to 70 miles (110 km). However they then made a fatal mistake, and started circling in order to re-group their formations for the attack. This ten-minute delay proved critical, and the first group of Hellcats met the raid, still at 70 miles, at 10:36. They were quickly joined by additional groups, and within minutes 25 Japanese planes had been shot down for the loss of only one US aircraft. The Japanese planes which survived were met by other fighters and 16 more were shot down. Of the remainder some made attacks on the picket destroyers Yarnall and Stockham, but caused no damage. Three or four bombers broke through to the battleship group, and one made a direct hit on South Dakota (BB-57) which caused many casualties but failed to disable her. Not one aircraft of Ozawa's first wave got through to the American carriers. At 11:07 radar detected another and much larger attack. This second wave consisted of 109 aircraft. They were met while still 60 miles (100 km) out, and no less than 70 of these aircraft were shot down before reaching the ships. Six attacked Rear Admiral Montgomery's group, making near-misses which caused casualties on two of the carriers. Four of the six were shot down. A small group of torpedo aircraft attacked Enterprise, launching a torpedo which exploded in the wake of the ship. Three other torpedo-planes attacked the light carrier Princeton, but were shot down. In all, 97 of the 107 attacking aircraft were shot down. The third raid, consisting of 47 aircraft, came in from the north. It was intercepted by 40 fighters at 13:00, while 50 miles out from the task force. Seven Japanese planes were shot down. A few broke through and made an ineffective attack on the Enterprise group. Many others did not press home their attacks. This raid therefore suffered less than the others, and 40 of its aircraft managed to return to their carriers. The fourth raid was launched between 11:00 and 11:30, but had been given an incorrect location for the Americans and couldn't find the fleet. They then broke into two loose groups and turned to Guam and Rota to refuel. One group of aircraft flying towards Rota stumbled upon Mongomery's task group. Eighteen aircraft joined battle with American fighters and lost half its number. A smaller group of nine Japanese dive bombers of the this force evaded U.S. planes and made attacks on Wasp and Bunker Hill, but failed to make any hits. Eight of these aircraft were shot down in the process. The larger group of Japanese planes had flown to Guam and were intercepted over Orote Field by 27 Hellcats while landing. 30 of the 49 Japanese planes were shot down, and the rest were damaged beyond repair. At 08:16 the US submarine Albacore had sighted Ozawa's own carrier group, and began an attack on the easiest carrier to reach. This happened to be the Taiho, Ozawa's flagship. As they were about to fire her fire-control computer failed, and the torpedoes had to be fired "by eye". Taiho had just launched 42 aircraft as a part of the second raid. Four of Albacore's torpedoes were off-target. Sakio Komatsu, the pilot of one of the recently-launched aircraft, sighted one of the two which were heading for Taiho and crashed his aircraft on it, but the last torpedo struck the carrier on her starboard side near her aviation-fuel tanks. At first the damage did not appear to be very serious. Another submarine, the Cavalla, was able to maneuver to an attack position on Shokaku by about noon. Three torpedoes hit Shokaku, setting her on fire. At 15:00 the fire reached the bomb magazine, blowing the ship apart. Meanwhile Taiho was falling victim to poor damage-control. On the orders of an inexperienced damage-control officer her ventilation system had been operated full-blast in an attempt to clear explosive fumes from the ship. This instead had the effect of spreading the vapours throughout Taiho, and at 17:32 she exploded and sank. TF 58 sailed west during the night in order to attack the Japanese at dawn. Search patrols were put up at first light. Ozawa had transferred to the destroyer Wakatsuki after Taiho had been hit, but the radio gear onboard was not capable of sending the number of messages needed, so he transferred again, to Zuikaku, at 13:00. It was then that he learned of the disastrous missions of the day before, and that he had only 100 or so aircraft left. Nevertheless he decided to continue the attacks, thinking that there were hundreds of planes on Guam and Rota, and started planning new raids to be launched on the 21st. American searches failed to locate the Japanese fleet until 15:40. However the report made was so garbled that Mitscher did not know what had been sighted, or where. At 16:05 another report was received that was clearer, and Mitscher decided to launch a full-out strike even though there was only 75 minutes to sunset. The attack went in at 18:30. Ozawa had been able to put up very few fighters to intercept - no more than 35 according to later estimates, but these few were skilfully handled, and the Japanese ships' anti-aircraft fire was intense. The US raid, however, contained 216 planes, and the majority were able to press the attack. The first ships sighted by the US strike were oilers, and two of these were damaged so severely that they were later scuttled. The carrier Hiyo was attacked by 4 Grumman Avengers from the Belleau Wood, and hit by at least one of their torpedoes, and later sank. The carriers Zuikaku, Junyo and Chiyoda were damaged by bombs, as was the battleship Haruna. 20 American aircraft were lost in this strike. At 20:45 the first US planes began to return to TF 58. Mitscher took the decision to fully illuminate the carriers, despite the risk of attack from submarines and night-flying aircraft, and the picket destroyers fired starshells to help the planes find the task groups. Despite this 80 of the returning aircraft were lost, some crashing on flight decks, the majority going into the sea. Many of the crews were nevertheless rescued over the next few days. That night Ozawa received orders from Toyoda to withdraw from the Philippine Sea. US forces gave chase, but the battle was over. The four Japanese attacks used 373 carrier aircraft, of which 130 returned to the carriers, and several more were destroyed onboard the two carriers destroyed on the first day. After the second day the totals were three carriers and 395 aircraft. Losses on the US side on the first day were only 23, and on the second 100, most due to night landings. The losses to the Japanese were irreplaceable. In the Battle of Leyte Gulf a few months later, their carriers were used solely as a decoy due to the lack of aircraft, and aircrews to fly them. 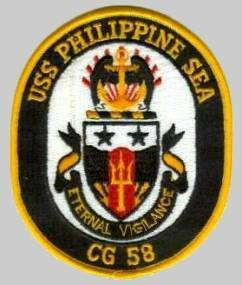 Philippine Sea (CG-58) was laid down 8 May 1996 by Bath Iron Works, Bath, Maine, launched 12 July 1987; and commissioned 18 March 1989. She was assigned to the Atlantic Fleet homeported at Mayport, Florida. The ship's first deployment to the Mediterranean and Red Seas came in 1990 as part of Operations Desert Shield and Desert Storm. During Desert Storm, the ship fired ten Tomahawk cruise missiles and boarded many merchant vessels during coalition actions against Iraq. 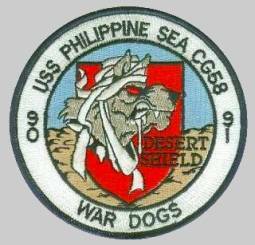 For its service, Philippine Sea received the Navy Unit Commendation, the Southwest Asia Service Medal and the Kuwait Liberation Medal. While deployed, the ship transited the Suez Canal six times and visited Italy, Greece, Turkey, Egypt and Saudi Arabia, returning home in the spring of 1991. Later in 1991, the ship served as the flagship for a joint task force conducting counterdrug operations in the Caribbean, earning the Joint Meritorious Unit Award. 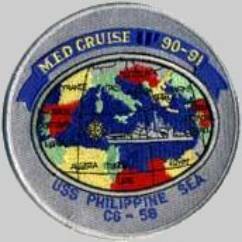 In May 1992, Philippine Sea sailed again to the Mediterranean and Red Seas. 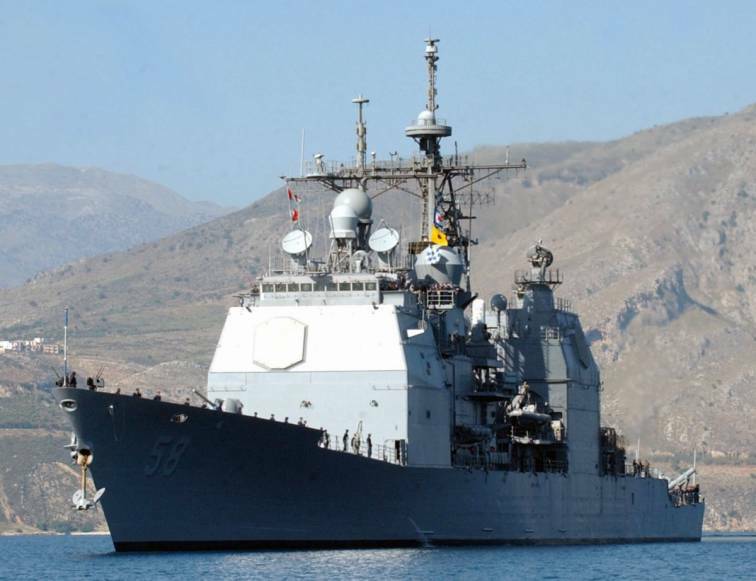 While deployed, the ship made two Suez Canal transits and boarded thirty-nine vessels in support of United Nations sanctions against Iraq, earning a second Southwest Asia Service Medal. Additionally, Philippine Sea supported United Nations operations off the coast of the former Yugoslavia. 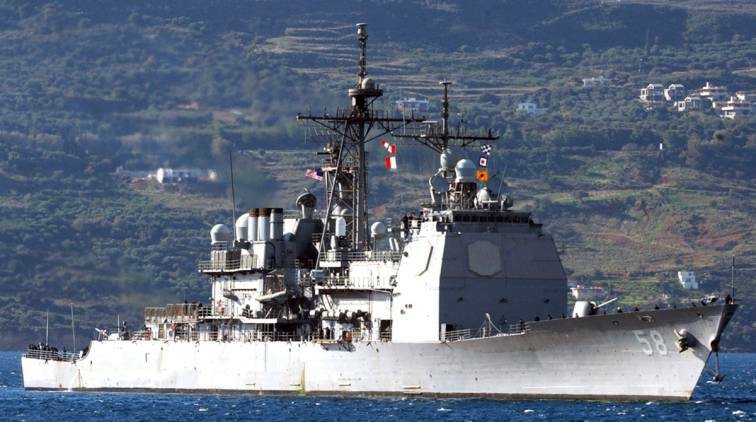 Port visits were made to Spain, France, Italy, Egypt and IsraeL The ship returned from deployment in November 1992 and received the James F. Chezek Award for the highest Naval Gunfire Support score in the Atlantic fleet in 1992. Philippine Sea completed a dry-docking period in Boston during 1993, followed by pre-deployment workups as part of the Saratoga Battle Group. 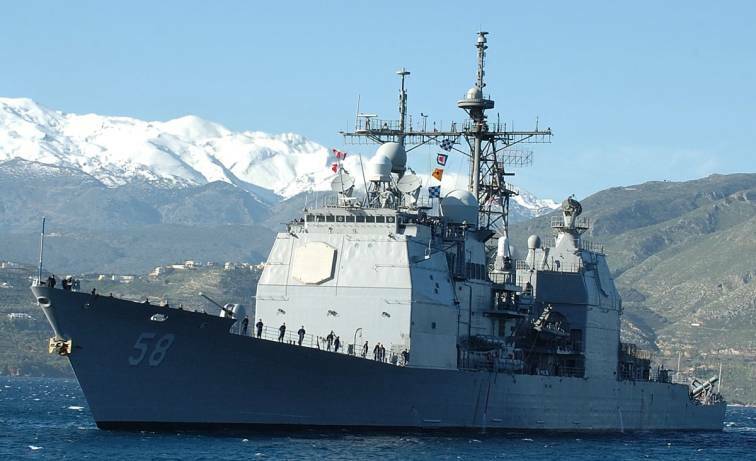 In January 1994, the ship sailed with the Saratoga Joint Task Group for its third Mediterranean deployment, returning again to the Yugoslavian coast in support of U.N. Operations in the Adriatic. 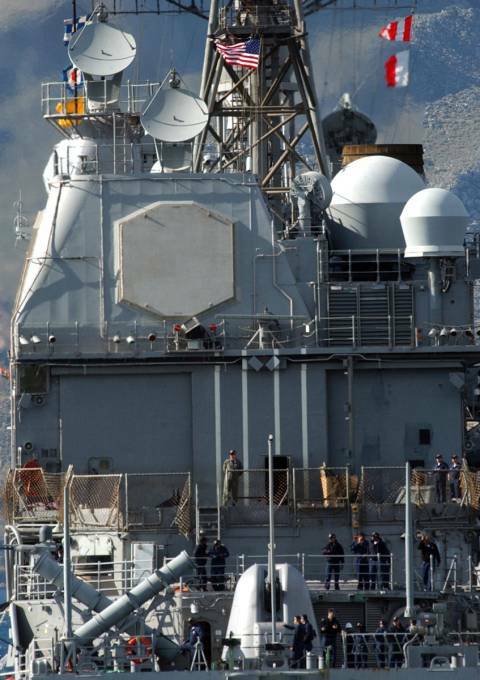 While deployed, the ship participated in numerous exercises with NATO forces. Philippine Sea made port calls in Spain, Turkey, Greece and Italy, and returned from deployment at the end of June 1994. For this deployment, the ship was awarded the Meritorious Unit Commendation. In July, August, November and December of 1994, the ship again conducted counterdrug operations in the Caribbean. 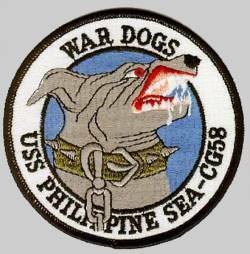 The following year, Philippine Sea was chosen as the flagship for U.S. Baltic Operations '95 in Northern Europe from mid-May to mid-July. The ship then returned to homeport for a yard period to close 1995. Philippine Sea deployed with the Enterprise Battle Group in the summer of 1996, to the Mediterranean and Adriatic Seas supporting U.N. operations in the former Yugoslavia and conducting multi-national exercises with seven other countries as part of NATO's Partnership For Peace program. Along with Enterprise (CVN-65) Battle Group, the Philippine Sea took part in a Sink Exercise (SINKEX) on August 9, 1998, near Puerto Rico, sinking a decommissioned cruiser, the former Richmond K. Turner (CG-20). The ship then deployed again with the Enterprise (CVN-65) Battle Group for a period of six-months in November 1998. The Philippine Sea took part in Operation Allied Force, operating in the Adriatic Sea. 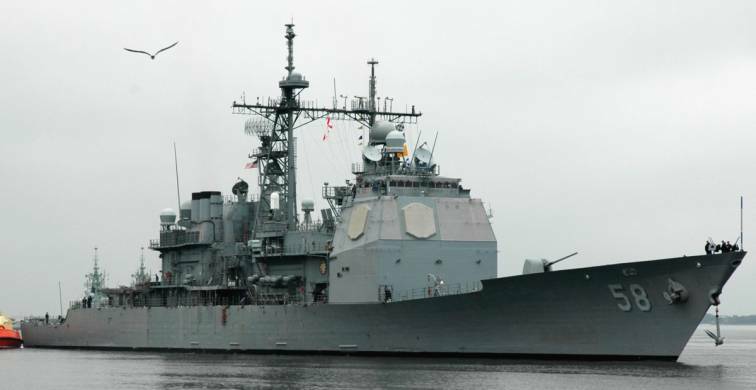 The Philippine Sea was the first U.S. ship involved in strike operations in support of NATO's Operation Allied Force, launching Tomahawk missiles. 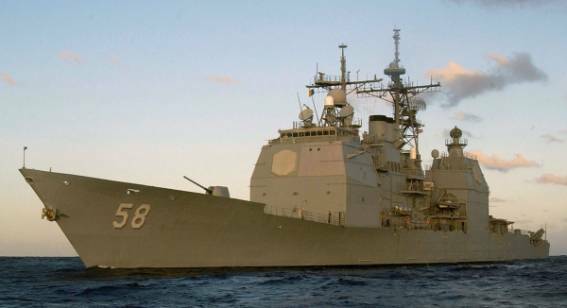 From 9 to 11 March 2001, the cruiser Philippine Sea was on alert as part of Unified Warrior, a complex series of missile firing exercises off the coast of Puerto Rico. 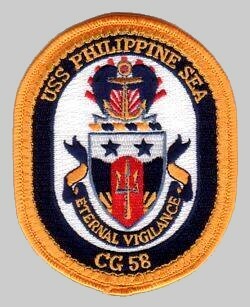 Philippine Sea was acting as air defense commander for the Enterprise (CVN-65) Battle Group. The 18-ship exercise also included units from Germany, Belgium, the Netherlands and Canada. 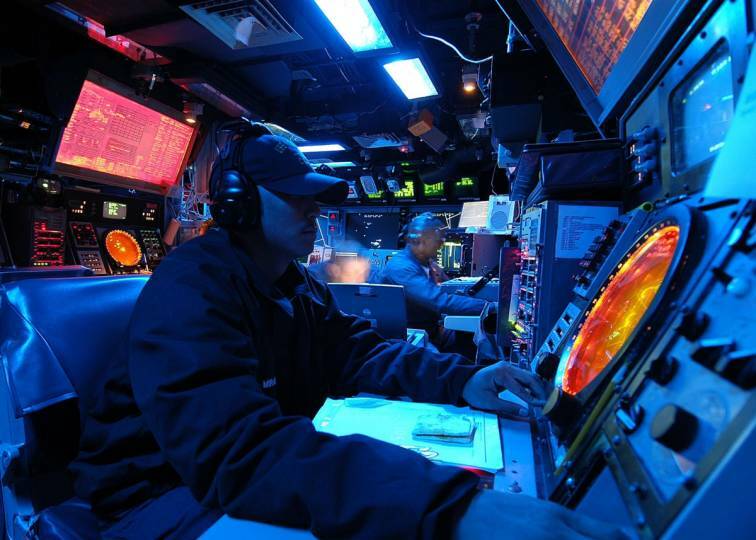 Philippine Sea coordinated precision maneuvers during the exercise to ensure each firing ship was positioned for their missile events, while stationing other ships nearby to gather data that was to be used to analyze and improve NATO and U.S. missile systems and tactics. 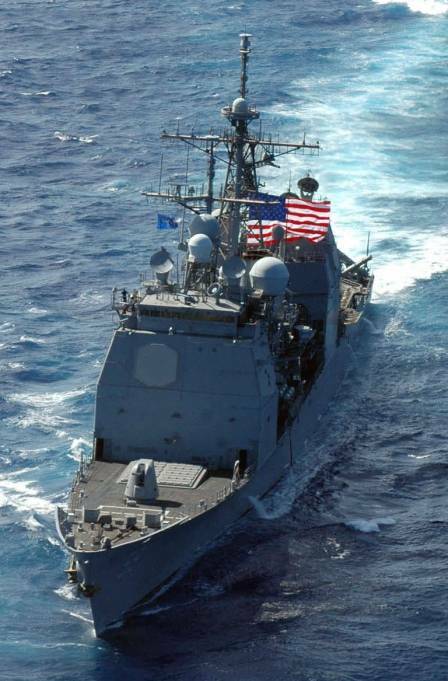 The Philippine Sea deployed in early 2001 as part of the Enterprise Battle Group to the Mediterranean and Arabian Gulf, as part of a scheduled six-month deployment. During that deployment, the ship took part in the Joint Maritime Course, a Royal Navy exercise hosted annually by the United Kingdom whose purpose is to train navies to operate in a joint service environment, providing large scale integrated training in land, maritime and air theaters. 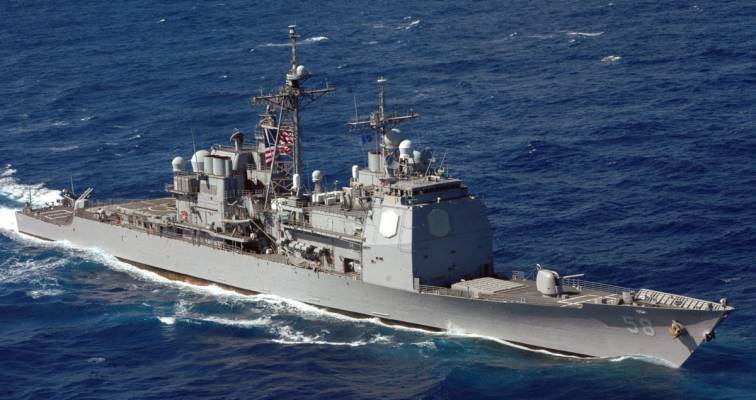 Though five vessels comprising the Enterprise Battle Group had already returned to their homeports, prior to the initiation of the strikes against Afghanistan, the Philippine Sea, as part of Operation Enduring Freedom, launched Tomahawk cruise missile for strikes against al Qaeda terrorist training camps and Taliban military installations in Afghanistan in October 2001. 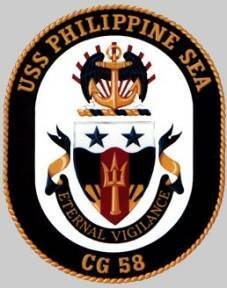 The Philippine Sea deployed with Enterprise Carrier Strike Group on 2 October 2003. During the ship’s deployment, Philippine Sea served as the overall command ship for Maritime Interdiction Operations (MIO) in the Persian Gulf. 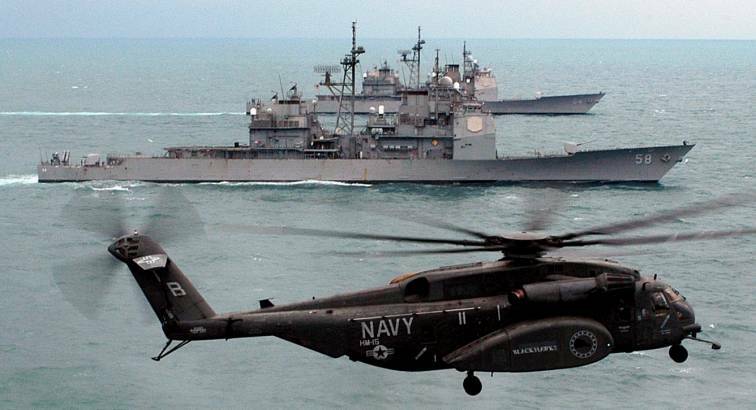 The ship’s Visit, Board, Search and Seizure team conducted more than 120 MIO vessel boardings in support of Operation Enduring Freedom, Operation Iraqi Freedom and the global war on terrorism. Most notable was Philippine Sea’s simultaneous takedown of two dhows carrying more than two tons of illegal drugs with possible terrorist ties. In addition, Philippine Sea provided protection of the al Basra oil terminal, keeping more than $60 million of oil a day flowing into the Iraqi economy. 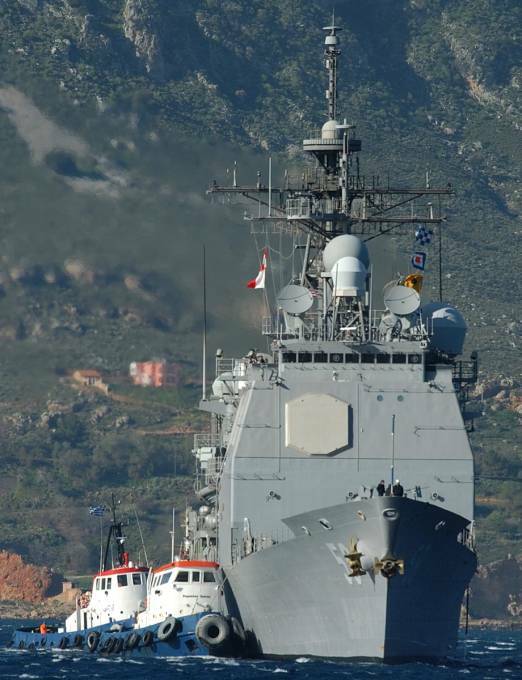 The guided-missile cruiser and embarked Helicopter Anti-Submarine Squadron, Light (HSL) 44, Det. 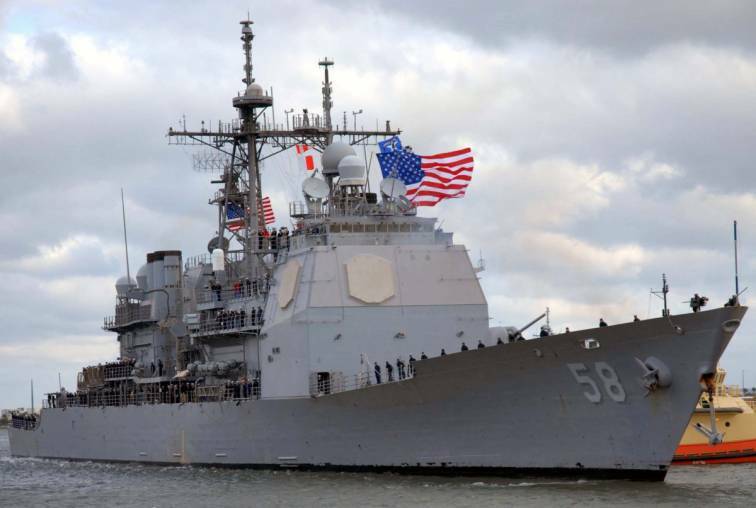 3 returned to its homeport of Mayport, Fla., 12 March 2004 after completing a five-month deployment with the Enterprise in support of the global war on terrorism. Most recently, PHILIPPINE SEA deployed in May 2005 as part of the Global War on Terrorism Surge ’05 and then again in June 2006. 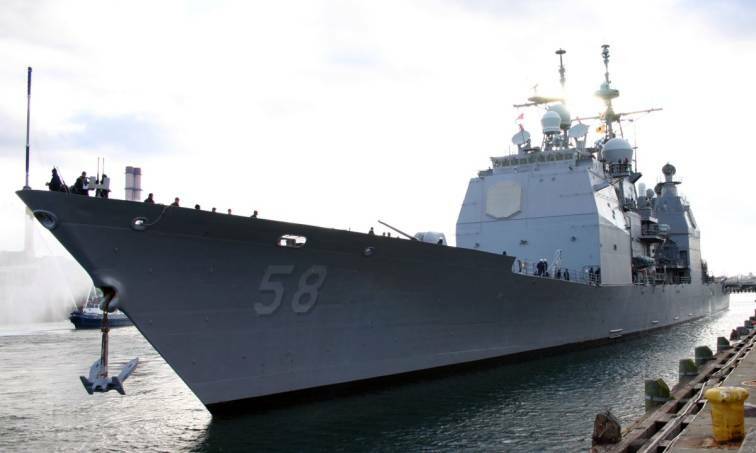 The surge was an implementation of the Navy’s Fleet Response Plan which ensures that crews and their ships are ready earlier, and remain ready longer. Deployment 2006 again saw PHILIPPINE SEA deploying to the Arabian Gulf, this time assigned to protect Iraq's fragile oil infrastructure as well as serving a key role in maritime interdiction. Acting as the flag ship for the embarked CTF 158 Staff, PHILIPPINE SEA conducted hundreds of boardings around Al Basra Oil Terminal, ensuring the safety of the workers living aboard it and defending Iraq's most precious source of economic independence.